Homemade Bacon Ranch Salad Dressing - with an easy low fat option too! Homemade Bacon Ranch Salad Dressing. 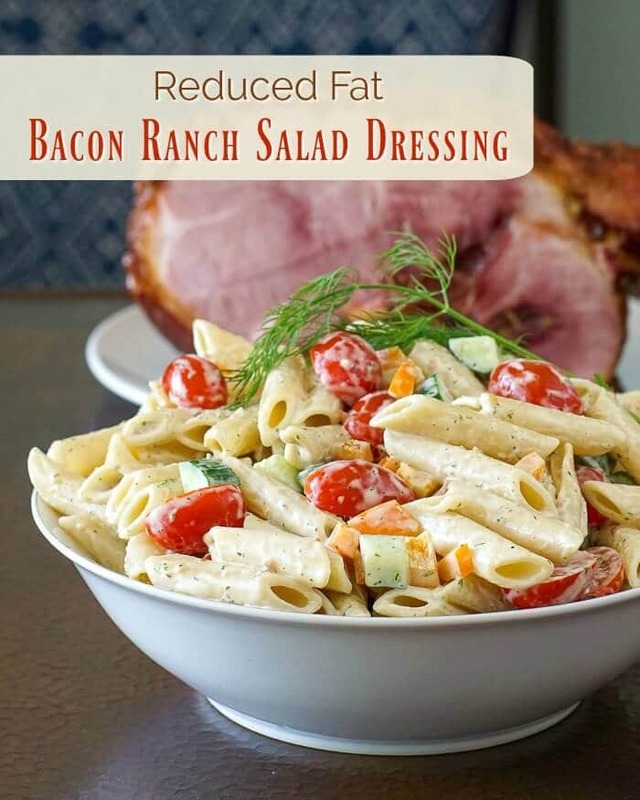 Easy to make as a low fat dressing too, using half fat mayo; plus ideas for Bacon Ranch Pasta Salad and Bacon Ranch Egg Salad. 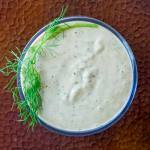 A funny thing happened on the way to this Homemade Bacon Ranch Salad Dressing recipe. It actually made a very hidden cameo appearance on my recently popular recipe post for Quick Montreal Steak Spice Refrigerator Pickles. In a display photo for the pickles, as seen below, I featured mine and Spouses lunch for the day; simple egg salad sandwiches. While the pickles got an immediate positive response, I also got several Facebook comments and messages asking how I made the egg salad sandwiches! Spouse and I have a shared love of simple egg salad sandwiches but I am a little finicky about them. I do not like warm egg salad and actually prefer to make them a day ahead on very fresh white bread and store them in an airtight plastic container in the fridge for lunch the next day. I think this strange egg salad sandwich preference stems from my mother, her sisters and friends. Particularly when they would attend baby or wedding showers back in the 70’s and 80’s when us six siblings were growing up. Inevitably each of the ladies would take along something to contribute to the tea, sandwiches and cookies that would be served at the celebration. Inevitably too, there would be far too much food. At the end of the evening, each of the ladies would then refill the same Tupperware containers that they had brought with them, choosing a selection of sandwiches and cookies from the other women at the shower. Next morning, I would always go to the fridge to see what that long rectangular Tupperware treasure chest held. If there were egg salad sandwiches, I would always try to snag those before my brothers and sisters. Spouse had a very similar experience as a child when her mother would attend one of these ladies nights out, so it’s a shared childhood experience for us. We might even occasionally squabble over the last couple of sandwich triangles left in the plastic container in the fridge. It’s a little odd that this happy childhood memory should stay with both of us for so long but we are both quite content to have it remain. Back to the recipe at hand and how I like to use it. Yes, we mostly do low fat vinaigrette type dressings around here these days but I have always been a big fan of creamy salad dressings and still indulge on one or two on occasion. I simply couldn’t do without blue cheese dressing with Buffalo Wings for example?…what would be the point? Ranch dressing and in particular Bacon Ranch Dressing is a real favourite of mine and I recently thought I could make a decent version after making a great Creamy Roasted Garlic Caesar Dressing. I’ve used the same idea for this recipe; using a base of roasted garlic and plain mayo, then adding flavour elements to that. The result was delicious and if you use a good quality “half the fat” brand mayonnaise, it’s easy to cut the calories by half at least. 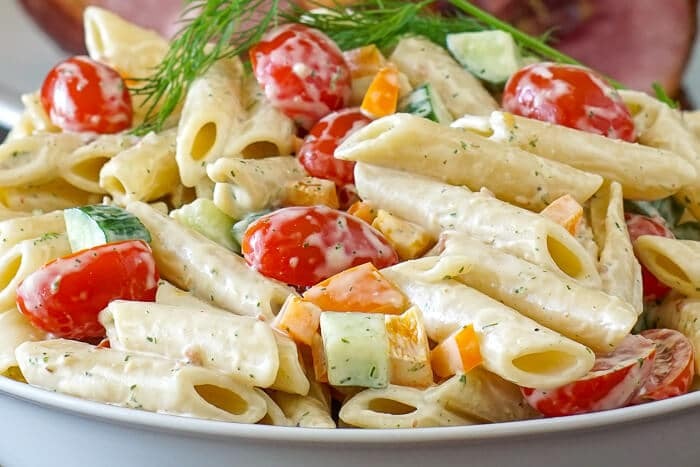 This option makes it a great choice as a dip for fried or baked chicken wings, in pasta salad or as those sandwiches can attest, great egg salad too. I mean bacon and egg is a natural combination; add garlic and herbs to that and you are really on to a winner. 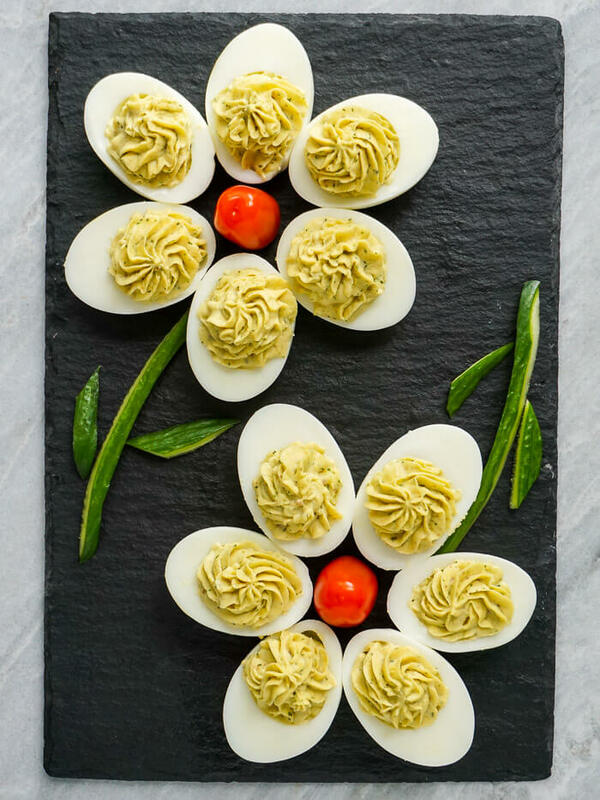 Please see the notes in the salad dressing recipe for tips on how to use the dressing in pasta salad and egg salad or deviled eggs. Like this Homemade Bacon Ranch Salad Dressing recipe? You may also like this great recipe for Low Fat Chipotle Ranch Dip. Homemade Bacon Ranch Salad Dressing - easy to make as a low fat dressing too, plus ideas for bacon Ranch Pasta Salad and Bacon Ranch Egg Salad. Servings: 24 servings ( 1 tbsp each) 1 1/2 cups dressing in total. Recipe Notes 1. Total preparation time does not include the time to roast the garlic. 2. To roast a head of garlic, cut a little off the top of the head (1/4 inch or so) to reveal the cloves inside. Place the garlic head on a square of aluminum foil, sprinkle on a little salt and pepper to season and then drizzle with a teaspoon of olive oil. Bring all sides of the aluminum foil together and twist to seal the garlic head inside. Roast in a 350 degree F oven for about 45 minutes. Squeeze the garlic cloves out of their skins and mash with a fork until a smooth paste forms. To make either of these, I cut the eggs in half and remove the yolks which I then mix with the salad dressing. For the Egg salad, I will chop the whites into a fine dice then mix with the yolk filling ...or for deviled eggs, I just pipe the filling back into the hollow whites. 1 1/2 cups chopped mixed vegetables of your choice. I used tomatoes, cucumber and sweet bell peppers. Previous Post: « Refrigerator Pickles – made with Montreal Steak Spice! I never keep it past several days. I’d suggest making a half batch if you are concerned about spoilage.